The standards for USDA beef labels are regularly changing. Come understand the process of grading, as well as the other types of verifications that the USDA gives out. If you’ve come over here from the post about how to buy and store ground beef, then you already know that brevity isn’t my strong suit currently. However, there are recent changes to USDA beef labels, and I want to keep you up to date. Have you ever had a moment when you realize that you’ve been tricked into spending more money by thinking something is fancier than it is? Like when you learn that aioli is actually another name for mayonnaise with garlic in it. For some, that’s their feeling regarding USDA beef stickers. For others, the extra cost is worth more than they spend. Let’s talk about USDA beef grading and USDA process verifications effect on both farmer and consumer. Did you know that farmer’s volunteer to get a USDA beef grade? Yep, completely voluntary. This a drawn out, difficult, and costly process for the farmer, and is done by a third-party company, not the government. What does it get the farmer? Think of it as a “spend money to make money” situation. Once the farmer undergoes and passes this process, their beef gets the shiny USDA sticker. That sticker (like aioli) is there to convince us that this package of beef must be better than the packages without it, which in turn makes us willing to spend the extra money. . .even if the other packages without the sticker have the exact same quality. Meat grading provides you expectations about the raising and killing of your meat. For you, the consumer, grading is beneficial for telling you what color your beef should be, how much marbling (the natural distribution of fat) it has, how tender it is, and as how old it is. The criteria for USDA beef grading is founded on grain fed cows. Grass fed cows are leaner and have less marbling than their grain-fed counterparts. This evaluation is conducted by an assessor looking at the meat between the 12th and 13th rib (the ribeye steak – which has the most marbling of any cut) and performing something like a pinch-test. Based on this evaluation your beef is given a grade, like prime, choice, or select. What Are The Different USDA Beef Grades? So what do each of the different levels of grading mean? Let’s look at them a little closer, going from the best, down. PRIME. Prime is considered the best because it has the most marbling. (You’ll remember from our ground beef post that the more fat the better the flavor.) There shouldn’t be any large or heavy clumps of fat. The marbling should look like it is drawn into the beef in thin lines. This provides nice even distribution of fat throughout the cut, making it more flavorful. This meat is also from younger cows, so the color is more pinkish-red and the fat looks milky-white. The flesh becomes darker and grainier the older the cow becomes. CHOICE. Choice is the next step down and is also what the majority of graded beef out there comes in at. Once you’re out of the prime level though, there are many things that can influence the grading. For example, the cut may have the same beautiful marbling as a prime cut, but the cow may have been much older at slaughter (or vice-versa) so it doesn’t qualify for prime-level grading. For the best flavor, look for thin lines of marbling, not heavy dollops. If you’re looking more for tenderness, decide based on color. There are subsets of gradings such as “high-choice”, or “low-choice” that lets you know where it just missed the mark on becoming a different grade. These subsets can save you time by doing the work of observing the meat for you. SELECT. Select beef is more tender because it is only taken from young cows (30 months or less). Since the cow was so young, however, the marbling is scarce, which means that the flavor will be lackluster. This isn’t the best grade for steak, but it is perfect for anything that will be braised or cooked for a long time, like soups and stews. Select beef is often the “in-house” choice for most groceries and supermarkets. OTHER. Standard, commercial, utility, cutter, and canner are all USDA grades, but these make up less than 1% of the all beef, so it usually isn’t found in stores. Old or over processed beef is more likely to get this grade. Keep in mind that choosing your meat based on marbling is like choosing a wine for it’s undertones; it’s a subtlety that most people won’t notice While yes, it is what makes steak so awesome, most people won’t turn their noses up to a select or choice steak, either. What are USDA Verification Programs? There are many USDA programs that will label beef into extra categories, like organic, all-natural, or grass-fed. For some people this is the first thing they consider when purchasing beef. For others, it is an afterthought. If these programs are important to you, read on to learn more about how they work. Similarly to grading, some farmers will get third-party assessments for these categories, and may even label them on their meat. However, third-party standards often vary from what the USDA requires for their own verifications. Look for the USDA sticker on the packaging or do the research to see if the third-party assessment group keeps up with USDA requirements. Organic. If you are choosing organic beef that means that your cows are raised on organic land, fed a diet that is 100% organic, can roam freely in the outdoors all-year (but only a requirement during grazing), and are not given any hormones or antibiotics. Farmer’s encourage organic cows to graze during grazing season. They may also be fed grain during other seasons; although this is more common when cows need fattened right before slaughtering. All-Natural. There is an important distinction that needs to be made here. “All-natural” means that your beef has had a minimal amount of processing and nothing added to it. This is already most beef’s standard, so why bother calling it all-natural? Simply, to get you to pay more (it’s like the aioli thing, again). Look for “naturally raised” on the packaging, instead. Naturally raised cows get humane treatment, never receive hormones, and don’t feed on junky by-products. All organic beef is naturally raised, but not all naturally raised beef is organic. Antibiotic Free. Antibiotics in animals are often used more as a safety precaution, rather than because they are necessary. This is concerning to some because certain cows are becoming resistant to these antibiotics, which causes an increase in antibiotic-resistant diseases in the cows. This causes long-term risks to the cows, and may or may not be able to spread to humans during consumption. But rest assured, antibiotic-free cows are never given antibiotics, even if they are sick. Grass Fed. 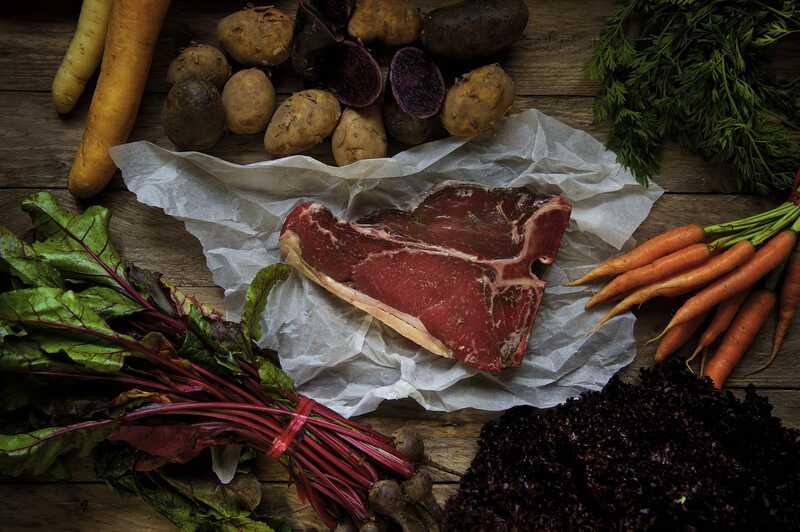 Grass-fed beef is the newest, hippest, thing in beef consumption. Grass fed cows’ meat has a different flavor than your standard super market fare, and doesn’t contain as much marbling because the natural grazing diet that the cows enjoy prevents the cows from getting too hefty. Ultimately, purchasing grass fed beef means that you are paying more to ensure that your cow enjoyed a happy life as close to what it would be if he was just a standard moo-cow on Old McDonald’s farm. This quality of life can cost you a pretty penny though; sometimes as much as 3x more than regular beef! Note: The USDA guidelines for grass fed cows covers how they eat, but didn’t make standards for how they are confined. Free roaming may not be a requirement outside of grazing time. As of January 12, 2016, the USDA no longer supports the label for “grass-fed” or “naturally raised” beef because they don’t “have the authority to define labeling standards and determine if marketing claims are truthful and not misleading. Therefore, it is inappropriate for the agency to offer these as AMS-defined marketing claims.” To read the statement from the USDA, go here. Any certifications (which last for 2 years) that a farm has, they can continue to label as having until their certification runs up. The FSIS (Food Safety and Inspection Services) not the AMS (Agricultural Marketing Service) is now in charge of assessing claims about grass-fed beef for a pre-approval. The FSIS is a government agency, which helps give marketing protection that the AMS previously could not. Two highly trusted companies, The Food Alliance and the American Grassfed Association, both still offer third-party assessments. Look for their seal on your packages of meat! “Grass-fed and grain-finished” beef is a thing. Like with the organic beef, the cows are given grain in the months before slaughter to fatten it up. You can also find the opposite, labeled as “grass-finished”. This is how some farmer’s slip by and trick you into paying more than you should for a deceiving product. Neither of these technically qualify as grass fed. Read this article from Tech Insider for a lengthier look at what the changes to grass fed labels means for you. I found it interesting, but it is a little harsh on consumers at times. 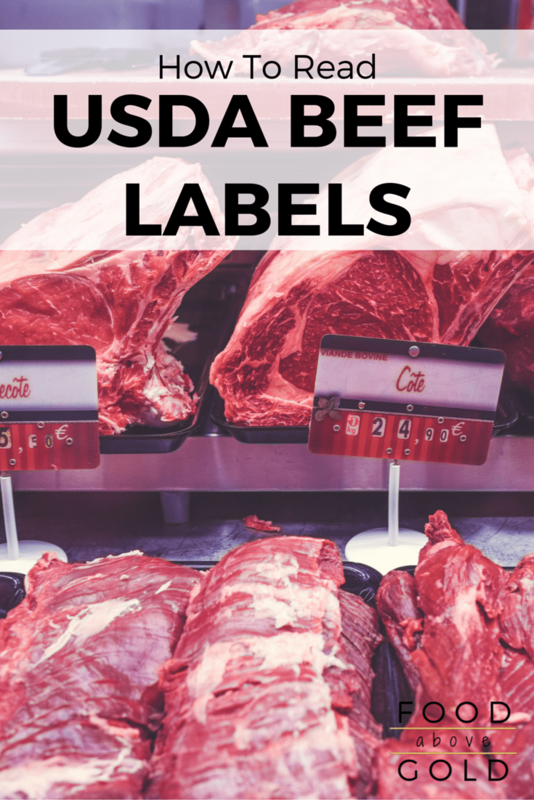 Now that you know all there is to know about USDA beef labels, here are my favorite recipes for using your new knowledge. Do you like to buy meat with USDA beef labels? What is most worth your money to you? Tell me about it in the comments or show me on social media (@foodabovegold). Use our exclusive hashtag, #CallMeMichelin, to show off your culinary knowledge!